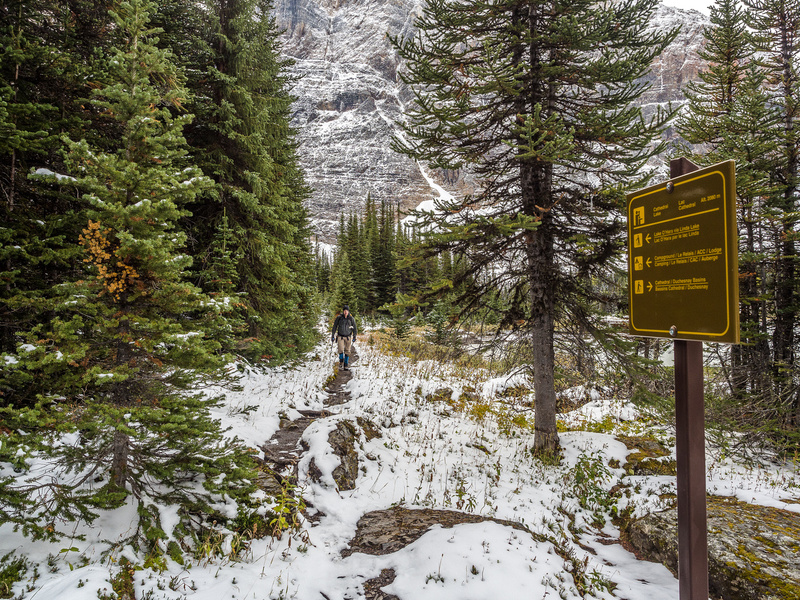 Difficulty Notes: No difficulties other than the long approach up the Lake O’Hara road. 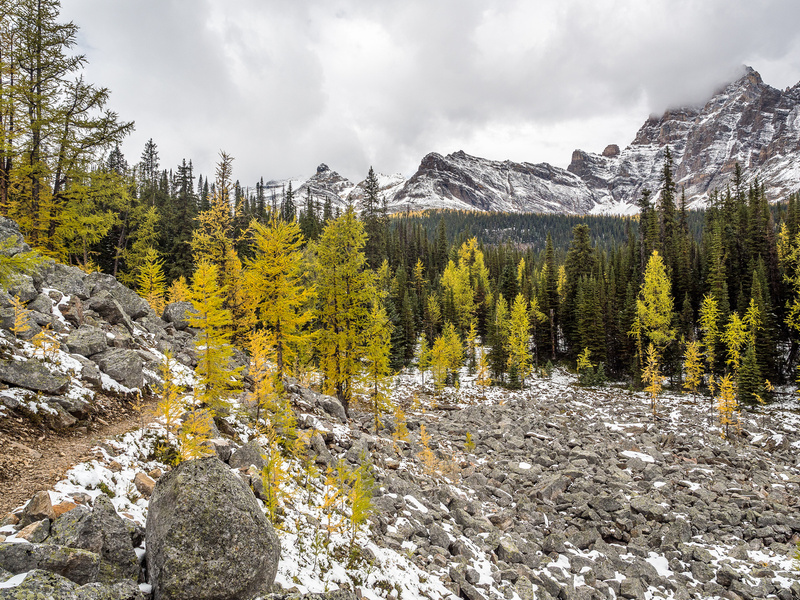 After a long outing the week before to the Egypt Lakes area and a somewhat gloomy weather forecast, I decided to play it safe on Saturday, September 23 2017 with a nice fall hike on the western edge of the Lake O’Hara region in Yoho National Park. Wietse decided to join me on this venture. 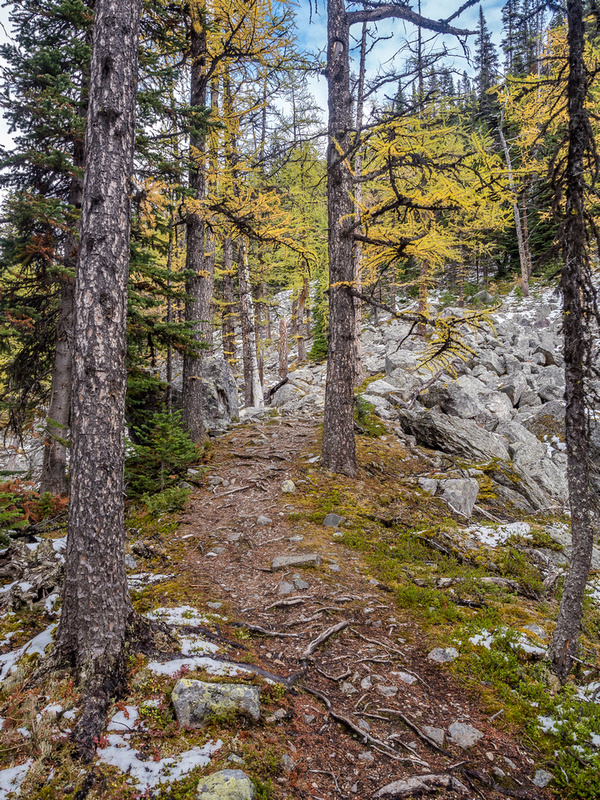 I found Consummation Peak while perusing the ViewRanger Landscape maps in areas that I knew had larches. 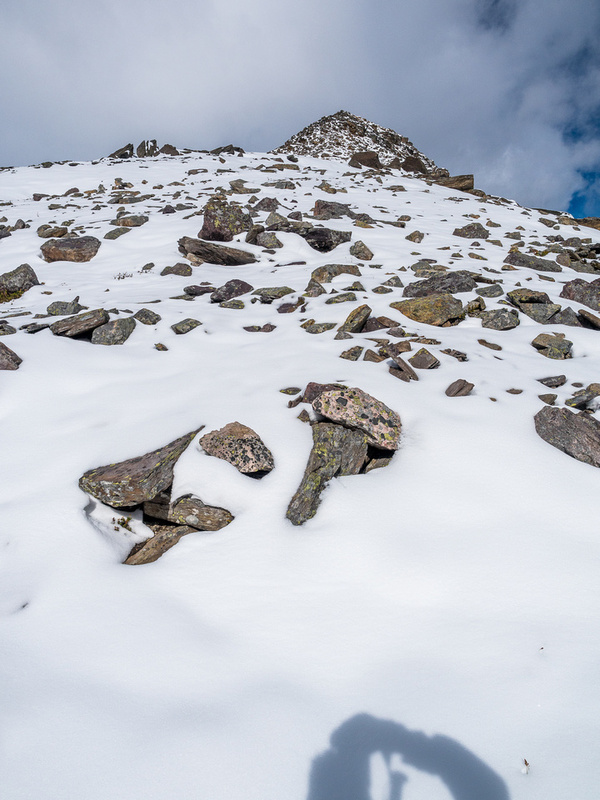 There was only one trip report online for this minor summit and it seemed to be exactly what I was looking for – something fairly low (not in the clouds) and easy (there was fresh snow). We got to the trailhead pretty early and started up the 9km of approach road at a brisk pace. We were delighted to see that the forecasted clouds hadn’t made their appearance yet and started thinking we might actually have decent views. I was looking forward to seeing the many lakes we’d pass through, including Linda Lake and the small Morning Glory Lakes which I’d seen from Walter Feuz Peak the year before. As we hiking up the easy road, we noticed a solo hiker ahead of us. 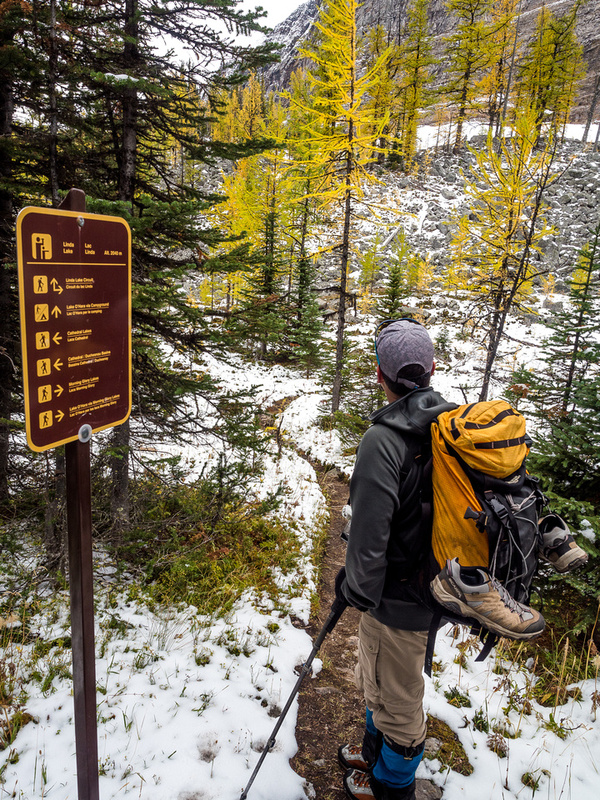 We caught up to him and chatted the rest of the way to our turnoff – approximately 1km before reaching the Lake O’Hara campground. 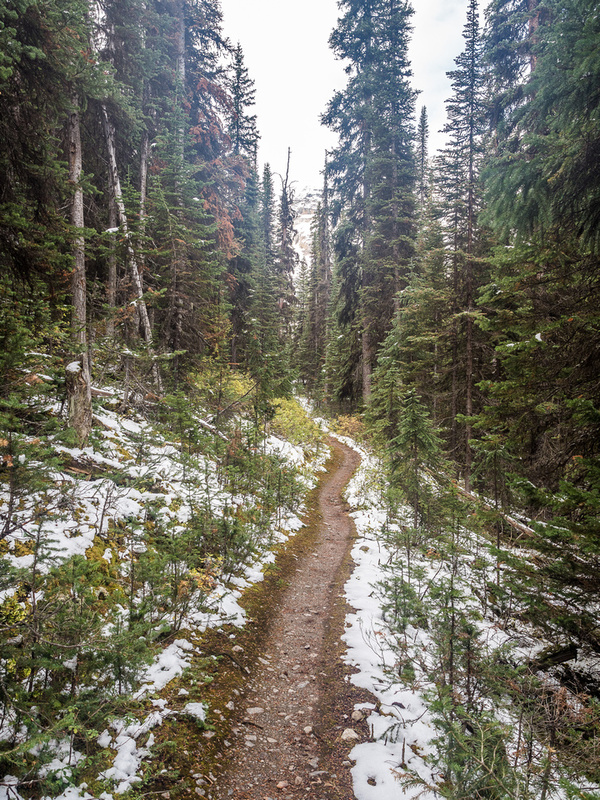 Once we turned off onto the Linda Lake trail we finally started to feel like we were actually “out there” again. It’s tough feeling that way when you’re marching up a road with buses full of people passing you. I suspected that we’d be alone in this lesser traveled area of the park, and for the most part I was correct. 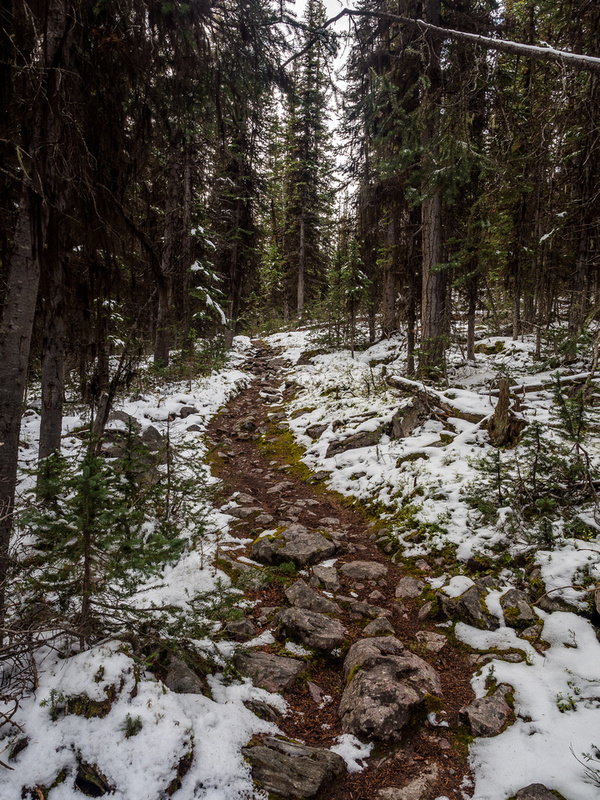 We started out hiking in pretty thick forest on a delightful trail with a skiff of snow cushioning our steps. 40 minutes after leaving the road we arrived at the shores of our first lake. Linda Lake was gorgeously still in the morning air and we took a short break here, enjoying the absolute tranquility of the place. 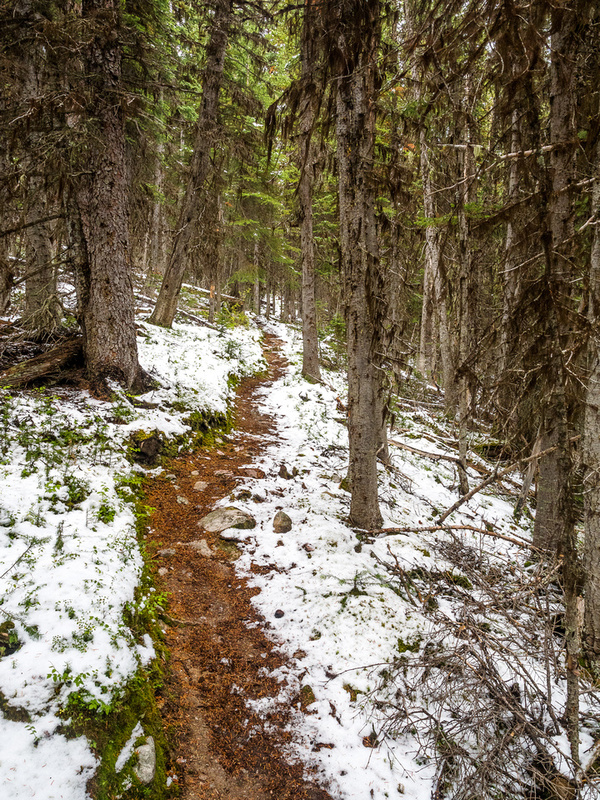 Snow was melting off the trees around us and we could hear the water drops falling to the ground below. The lovely, still waters of Linda Lake with Odaray Mountain in the background. Ringrose and Hungabee reflect in Linda Lake. 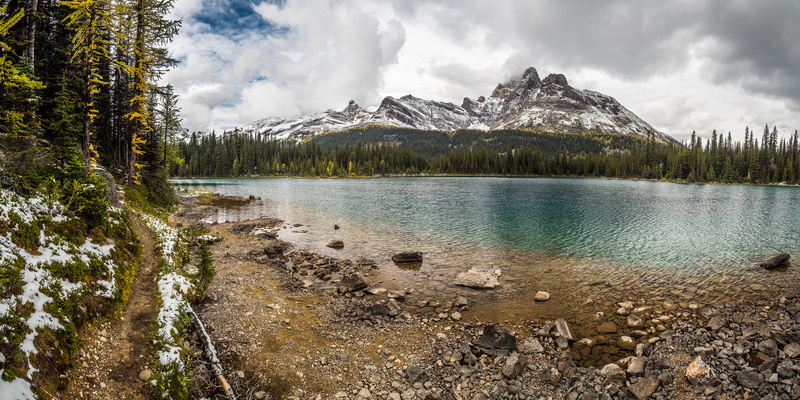 After hiking the west shores of Linda Lake, we turned west again and headed up towards the Cathedral Lakes. Within half an hour we were at our second set of lakes, once again standing still in the calm morning air. The fact that the lake was partially frozen helped it stay calm of course… We quickly passed the north shore of the third lake and started a steep grunt towards Consummation Peak and Monica Lake. There’s a cliff band guarding the southeast ridge of Consummation and you can either go left or right around it. 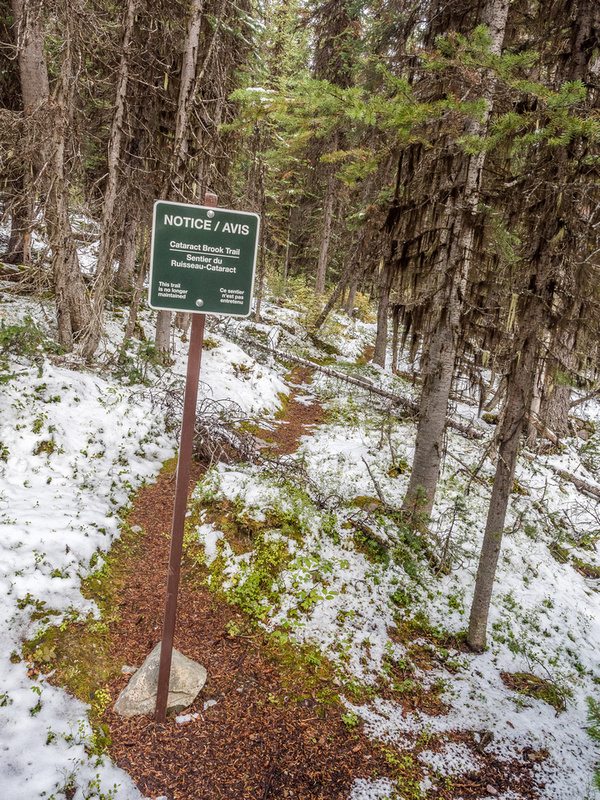 We choose to follow the trail towards Cathedral Prospect and Monica Lake as far as possible before cutting left up a steep, grassy slope towards Consummation. 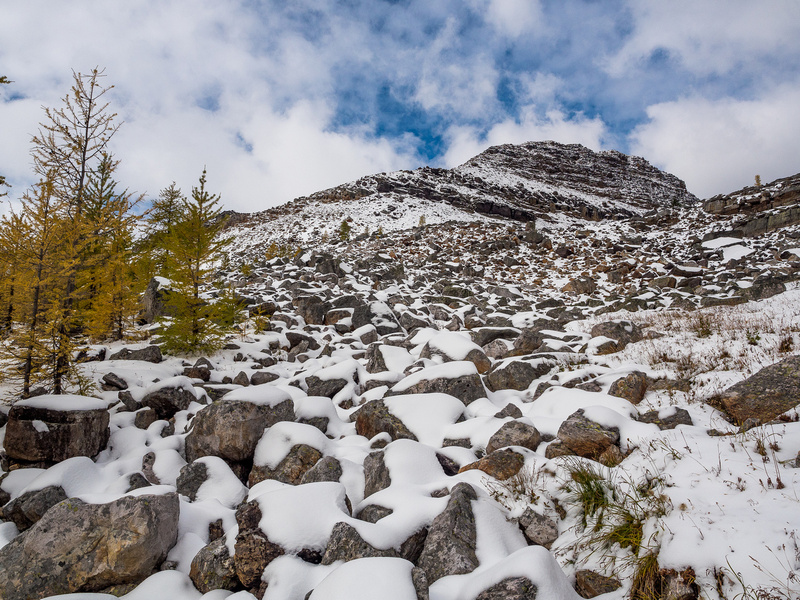 The steep slope soon gave way to boulders which were slick with fresh snow. 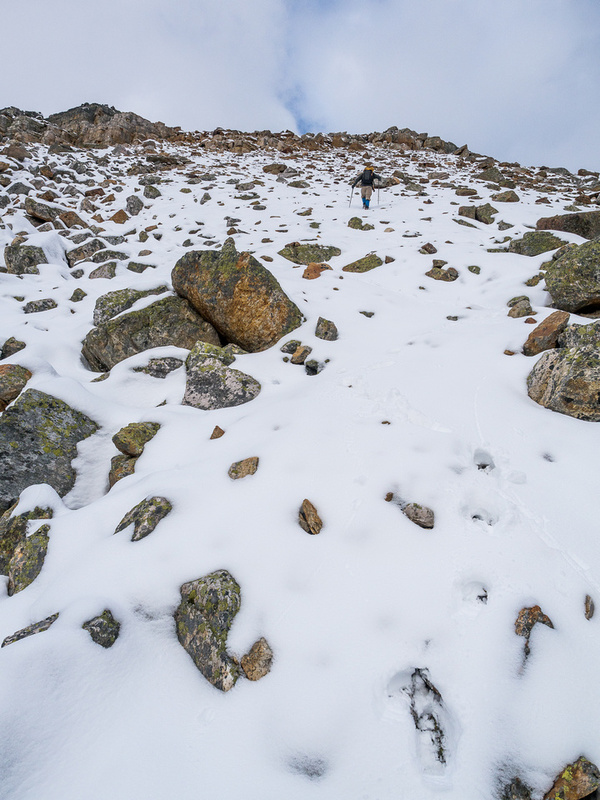 We delicately picked our way up the next few hundred meters before topping out on the expansive summit. Our views throughout the climb, above treeline, were much better than expected. The sun even came out and baked us for a few minutes while we ascended. 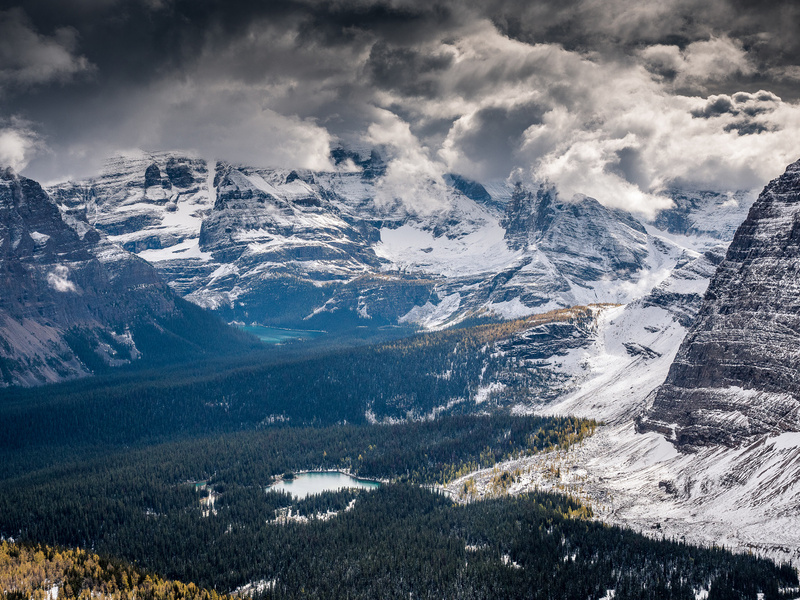 The rest of the Lake O’Hara area looked to be socked in cloud cover and as expected, all the 11,000ers were covered in clouds, making them look very dramatic. 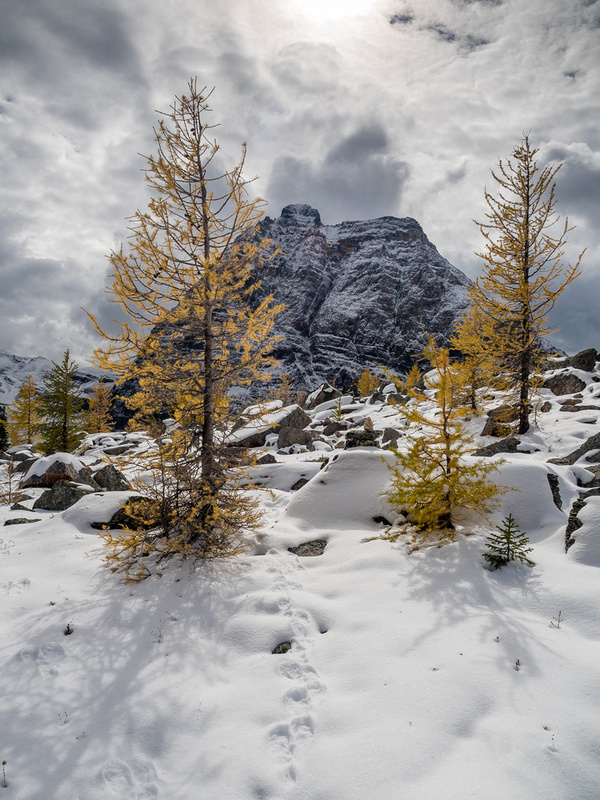 Thankfully the larches were actually yellow this weekend (!) but we still spotted a surprising number of green ones. 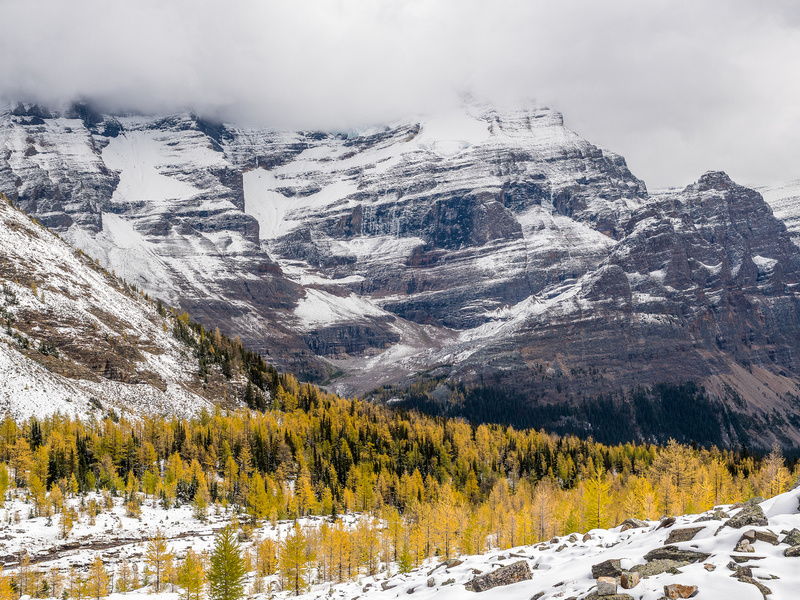 The fall color turn is certainly off this year for some or another reason. We enjoyed the views and our lunch at the summit before turning our attention to our next objective – Monica Lake. 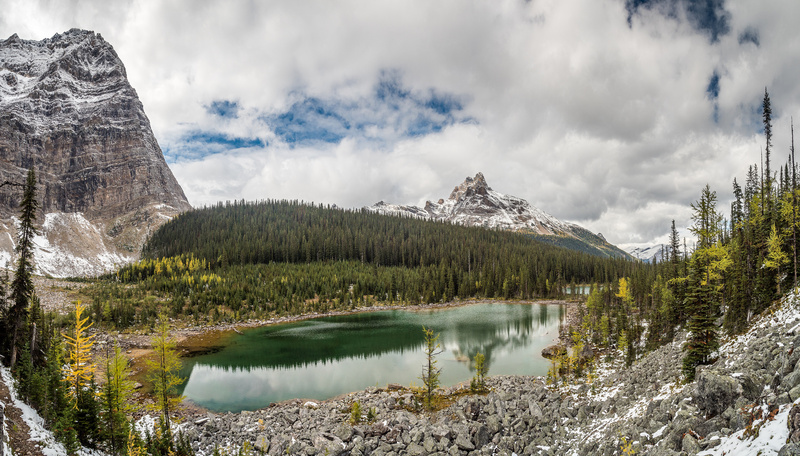 A tele-pano of the more familiar Lake O’Hara with the Opabin Plateau at center distance. 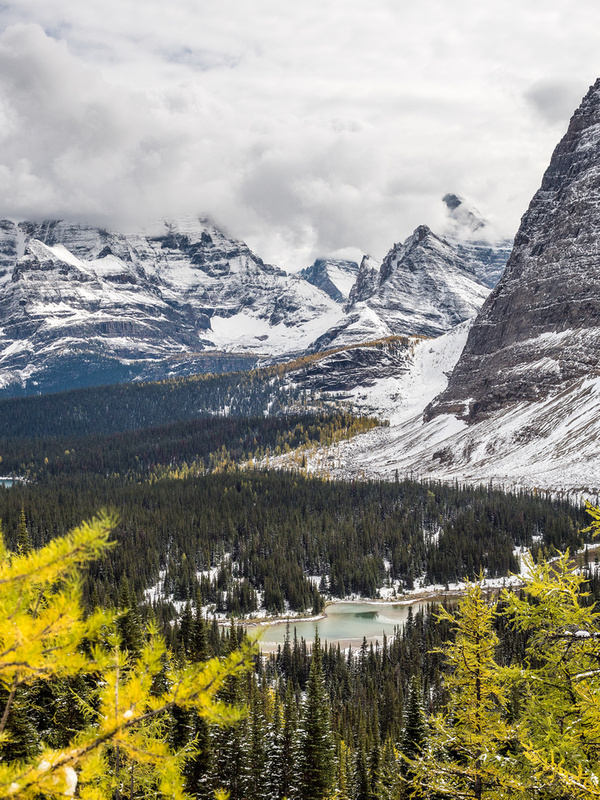 Summit views towards Linda Lake and Odaray Mountain (R). 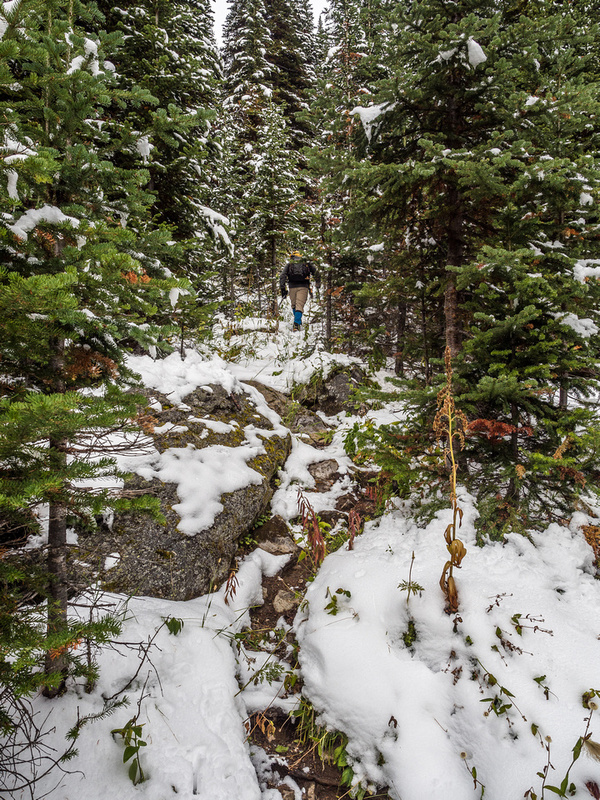 We descended quite quickly on the slick SE slopes before rejoining the trail and continuing on towards the Cathedral Prospect and overlook for Monica Lake. 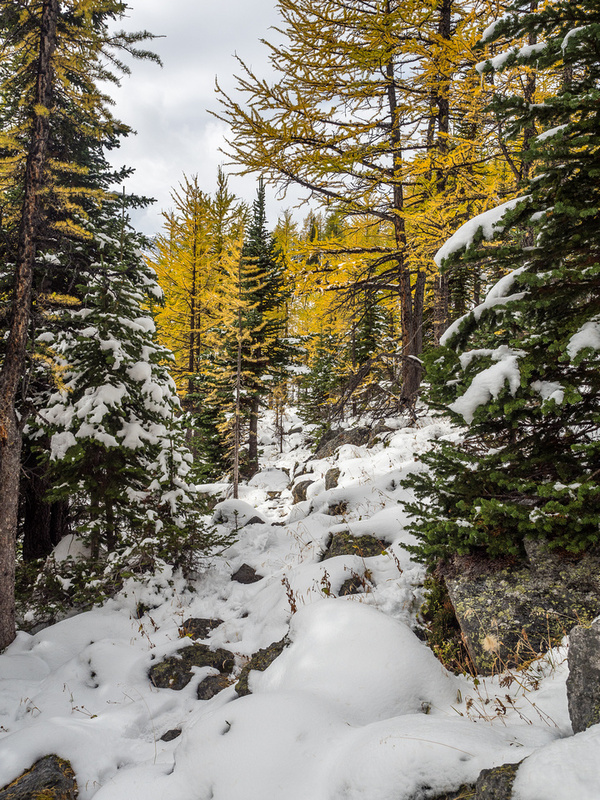 The larches and terrain around the small lake was pretty, but overall the area was underwhelming compared to all the many other lakes in the O’Hara region. 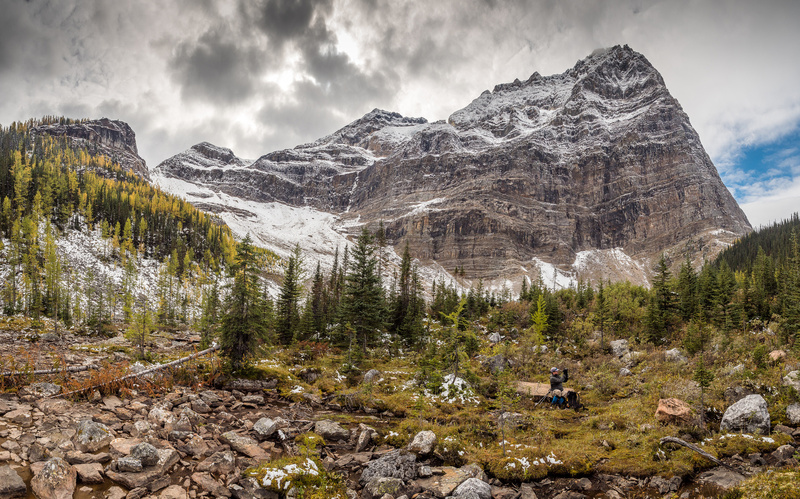 One of the only reasons to visit Monica Lake IMHO, is if you want solitude in a very busy area. We still hadn’t met anyone else on what we knew was a very busy weekend. 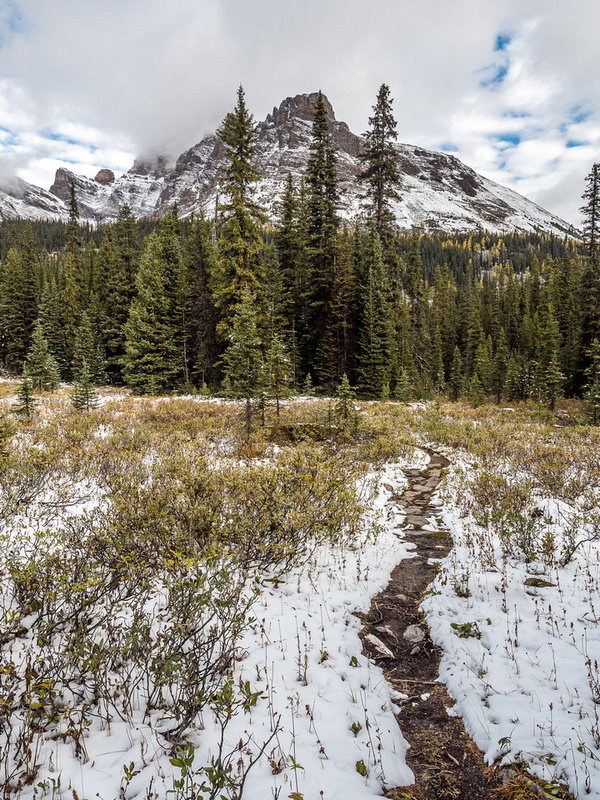 As we returned on the trail back towards the Cathedral Lakes, we finally heard voices and met our first hikers of the day. From this point onwards, we met a few other hikers – but still not many considering how busy the rest of the area turned out to be. Another great view over Linda Lake from the trail running alongside its southern shores. Stunning color of Linda Lake. The Morning Glory Lakes are typical of the area. 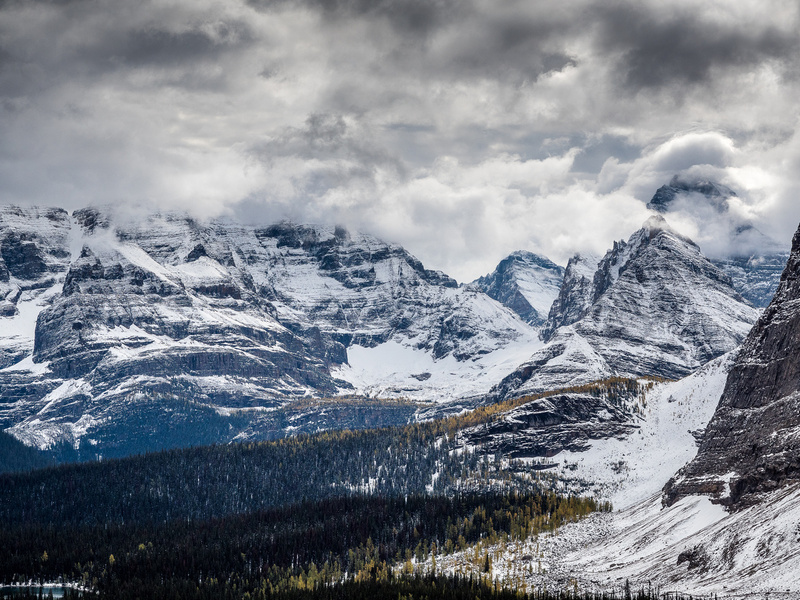 Cathedral Mountain at left. Once we finally got back to Linda Lake, our return path deviated from our approach. 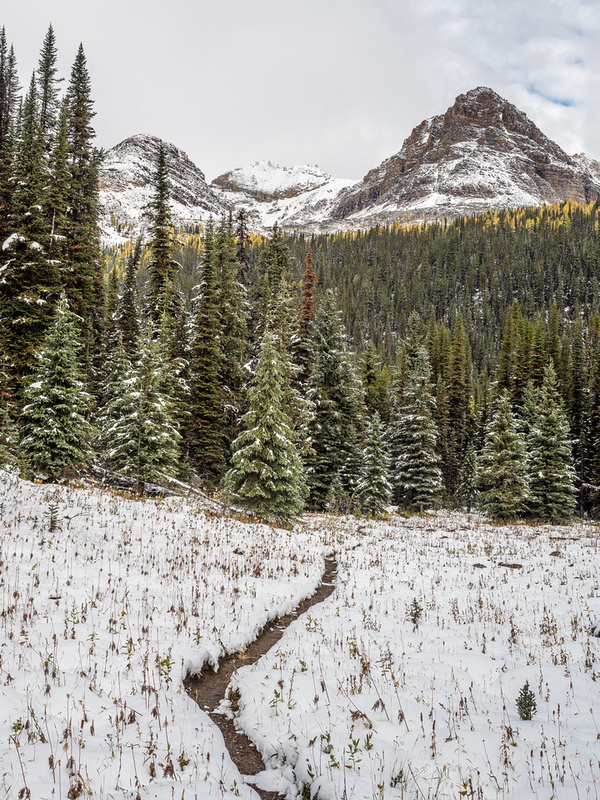 We planned to follow the trail around the southern end of Linda Lake before continuing on to the Morning Glory Lakes. 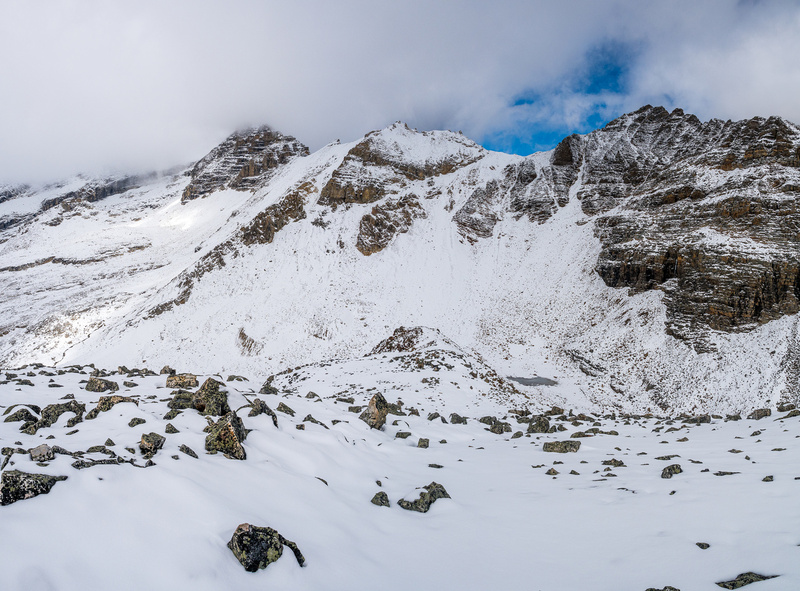 From there we would traverse around a ridge and make our way towards the Elizabeth Parker ACC Hut and down to the Le Relais shelter to wait for a return bus if possible. Worst case scenario the bus would be full and we would walk out the 11km on the road. This plan worked out well. The small Morning Glory Lakes were pretty. Again – they aren’t quite up to the standards of lakes like McArthur or Oesa but they are much quieter. We enjoyed another break before re-entering the forest and starting our way to the Le Relais hut. Nearing the ACC hut with great views of Schaffer and Biddle. At the hut we realized that area was much busier than we realized. I chatted with a park employee who told me that over 80 people had walked into the area up the long 11km approach road that day! Wow. 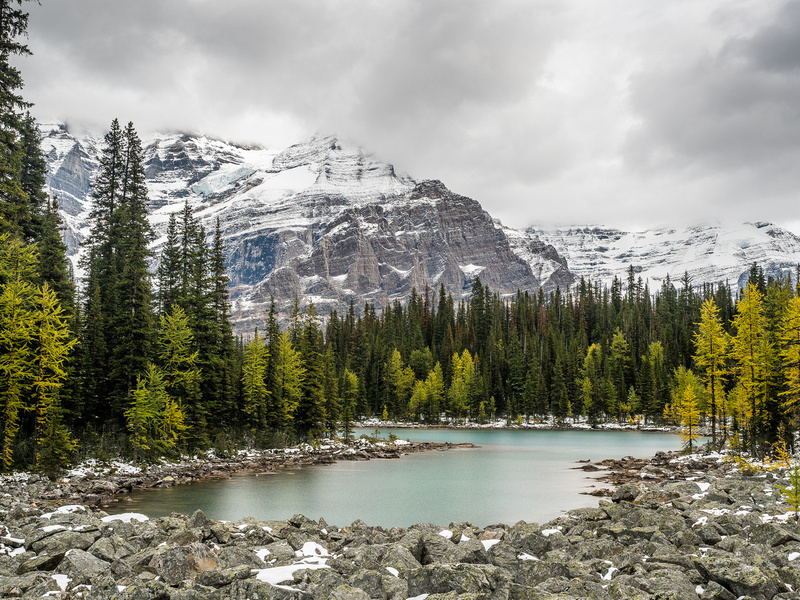 She also repeated some concerns I’d heard earlier in the year about the popularity of the Lake O’Hara area. 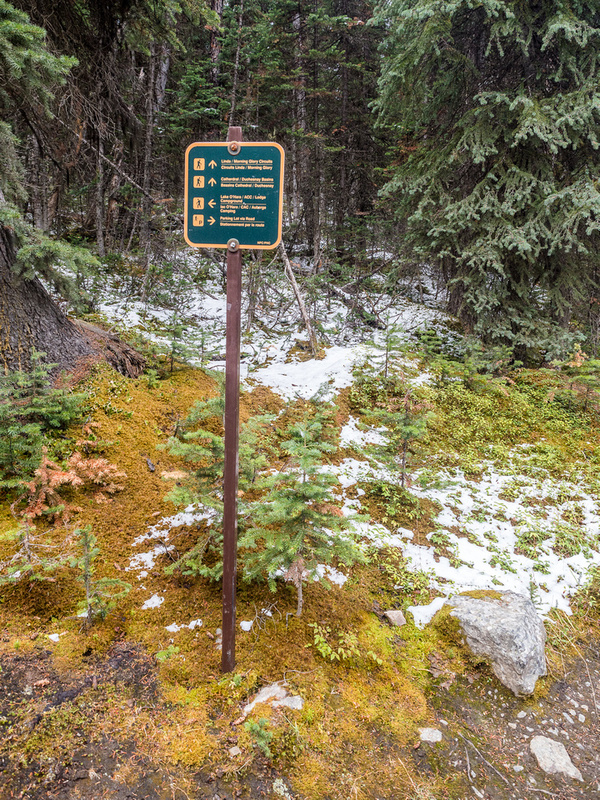 Apparently Parks Canada is now posting someone at the bottom of the road to make sure people walking it realize there might not be a bus ride back down at the end of the day. The buses can only take 72 people (total) at each time slot and obviously people with reservation (i.e. a ride UP), get priority. It’s interesting to see what happens when a place like this gets too much attention. 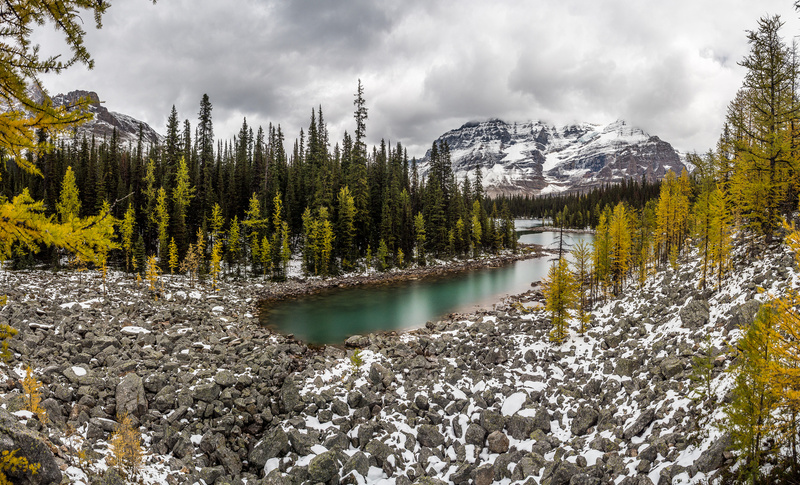 I decided that I would start visiting some other places in the fall from now on – there’s many other spots with larches besides Lake O’Hara! A sign indicates the turnoff from the long approach up the road. 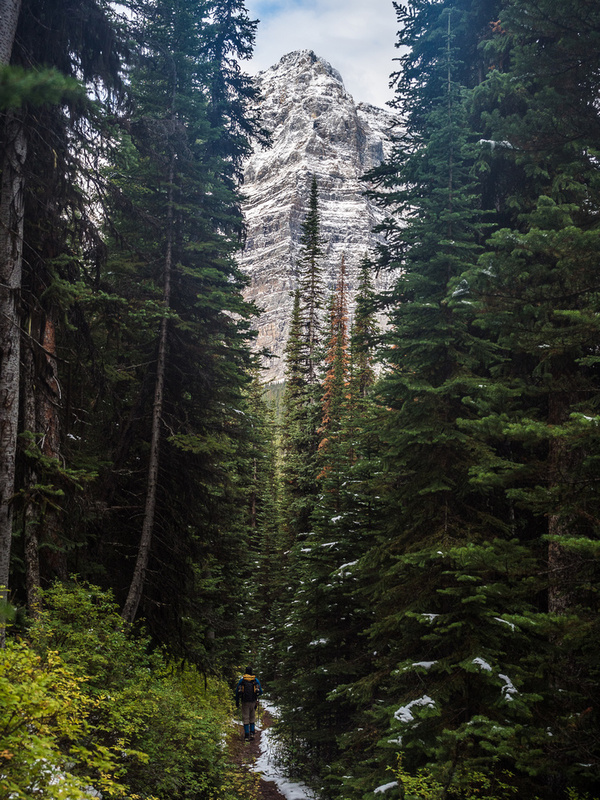 Wietse enjoys the morning solitude of the trail to Linda Lake with Odaray Mountain's impressive north face rising above. There used to be a better option than the road to approach this area - the Cataract Brook Trail. It's still there, but is not maintained. 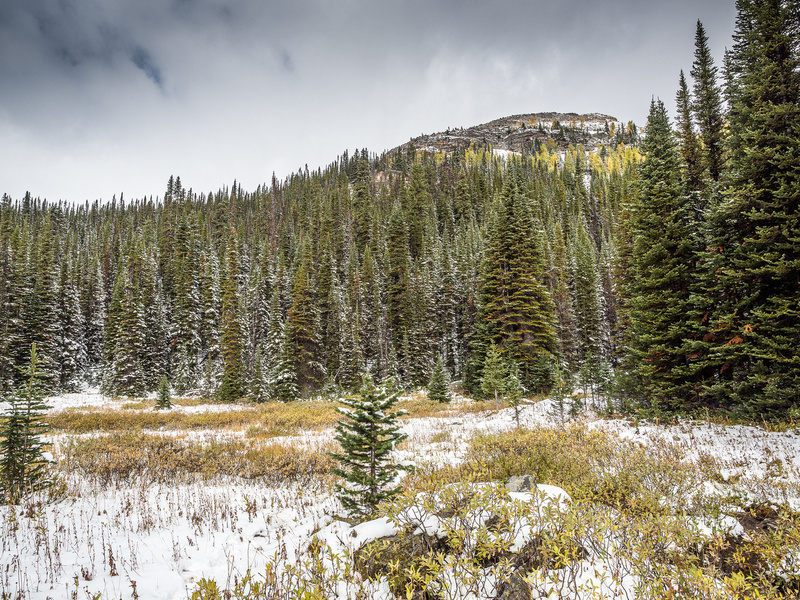 More snow as we approach Linda Lake. Heading from Linda to Cathedral Lakes with Consummation Peak now visible at distant left. 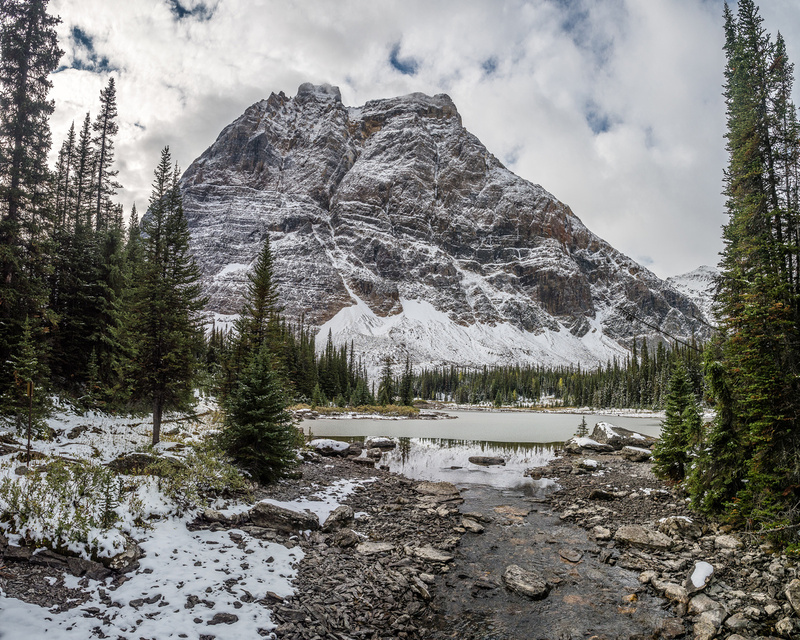 Cathedral Lakes are almost completely frozen - Odaray rises over them dramatically. 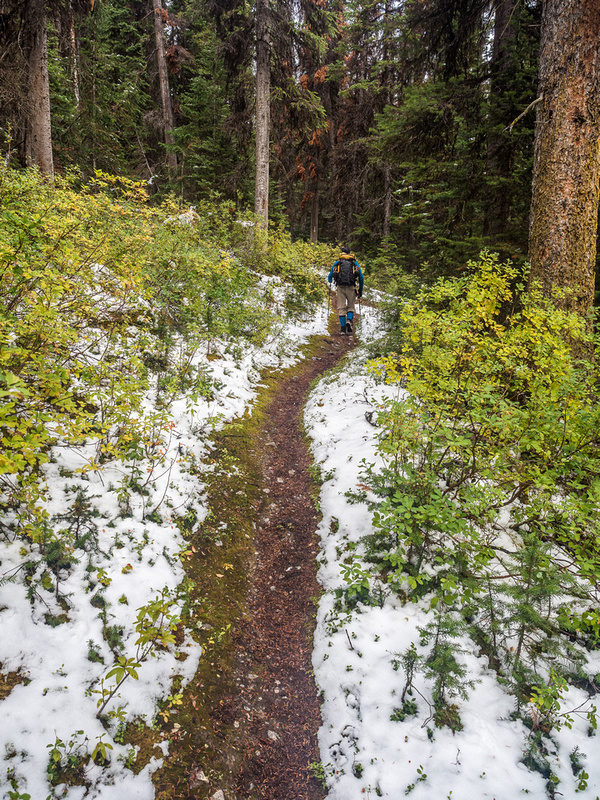 It's getting harder to find the trail under the snow. 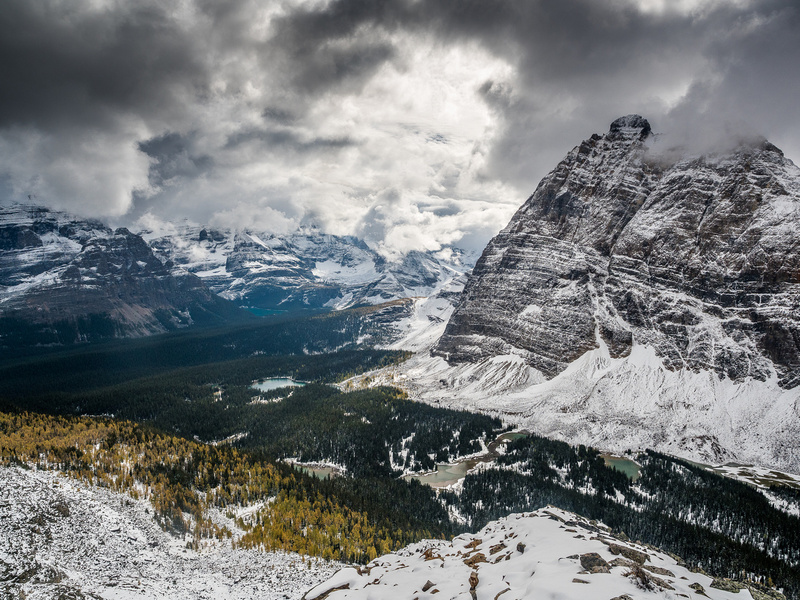 Great views back over the Lake O'Hara region from the trail as it starts to climb more steeply. Excellent views from the lower boulder field on Consummation as we ascend. Odaray in the foreground. The summit is just above us here. Wietse comes up the ridge with the dramatic scenery opening up below us now. At the summit looking west at the ridge between Odaray (L) and Cathedral (R) - both of those peaks out of sight here. 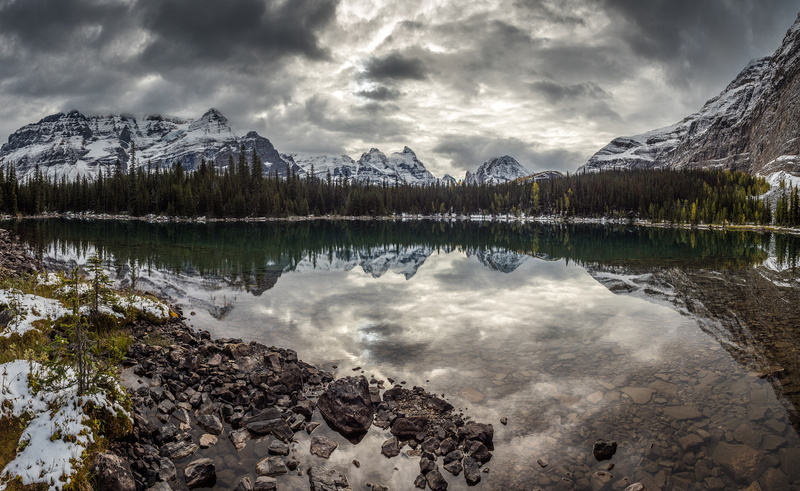 Looking over Linda Lake towards Lake O'Hara with Hungabee and other giant peaks rising into the clouds beyond. Summit views now include the Cathedral Lakes in the foreground with Linda left of center and of course, Odaray at right. 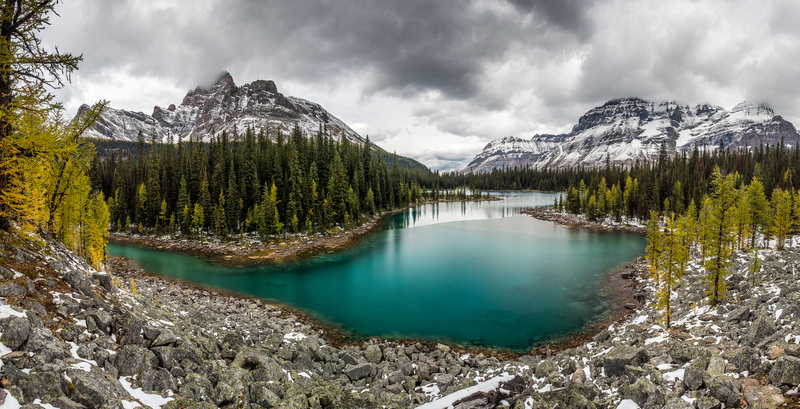 A tele-pano of the more familiar Lake O'Hara with the Opabin Plateau at center distance. One of the Cathedral Lakes (there's four of them). Looking back up at Consummation Peak from the trail to Monica Lake and the Cathedral Prospect. Wietse tries to follow the trail through all the fresh snow. 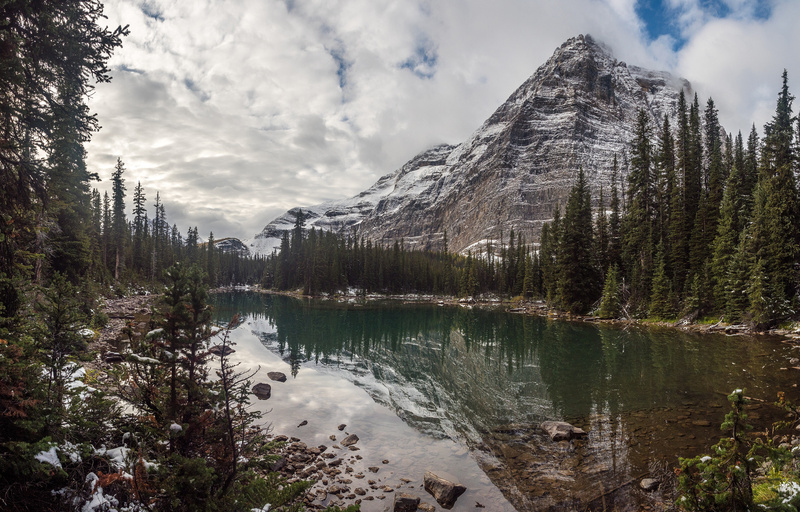 The Monica Lake basin is pretty - and very quiet - but not very dramatic compared to many other lakes in the Lake O'Hara region. Enjoying the scenery as we descend back towards the Cathedral Lakes. 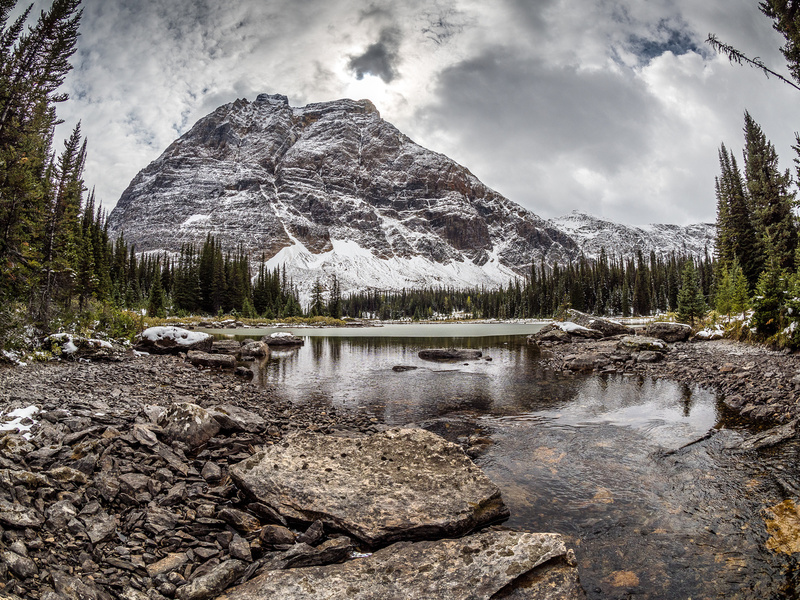 A fisheye view of Cathedral Lakes with Odaray Mountain. 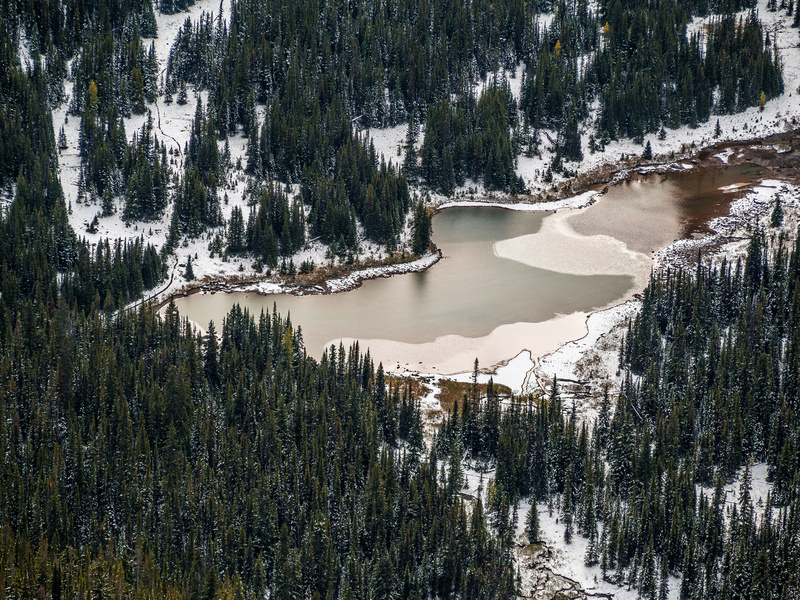 A beautiful view of the frozen western end of Linda Lake. A last glance back over Linda Lake towards Cathedral Mountain. At the southern shore of the center Morning Glory Lake looking back at Odaray Mountain and Wietse enjoying a break. An interesting section of the trail. 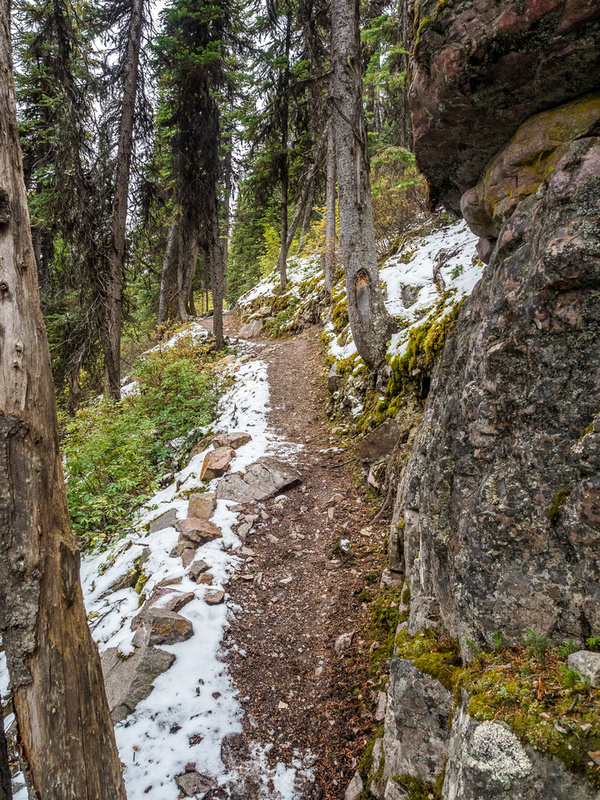 The trail was a bit dull through forest, but still well maintained with some interesting features. 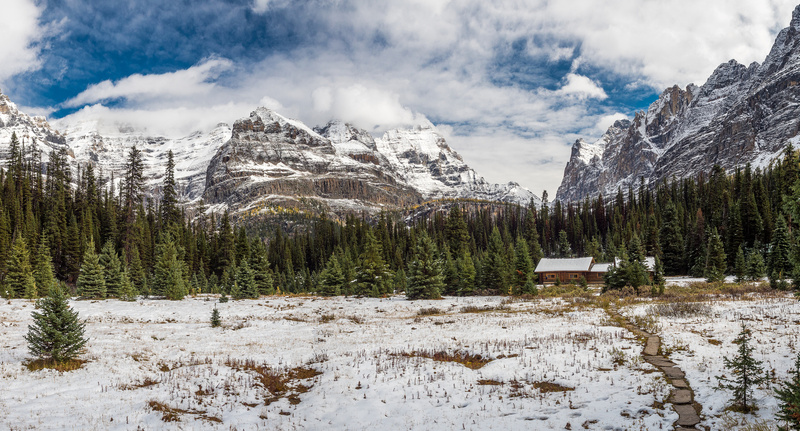 The deluxe Elizabeth Parker ACC Hut is certainly situated in a gorgeous area of the Canadian Rockies!